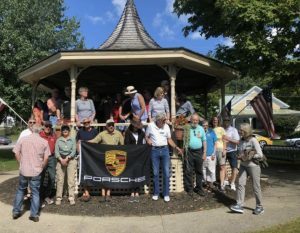 Alessandro Iuppa (Brownsville) has conjured up a great tour starting in Quechee, heading south through Reading to Ludlow and then Lunch in Peru. 9:30 a.m. — Meet in Quechee near the Public diner on Route 4, address 5573 Woodstock Rd (Route 4). Look for the Porsche flag! There is a gas station nearby and also the diner will be open for coffee and a bathroom break. 9:45 a.m. — Driver’s meeting. Chester as most know is a charming town. By the time we arrive there should be parking available as we come into town. Al and Sandy Gilmour have tested the route — no dirt, a few asphalt bumps but mostly good road. Some good twists out of Reading. This entry was posted in Archives_1, Tours. Bookmark the permalink.